OGG plugin does not work in the version of Gideros 19.2.1 ?? I found the reason: an antivirus blocked the plugin ..
hi oleg, I was exploring gideros and found the GSFXR addon. I created a quick sound with it, tried it in my code. Everything was fine on the emulator but when exported to android the app crashed. I looked a little bit further and saw the GSFXR android extension, I clicked it, exported again to android => crashed! I did not look further because sound is not my priority right now. Do you have some hint for the future me (and others)? ok, I was just geeking with this plugin. No worries, I may ask the question if I happen to use it. Thank you oleg. GSFXR works for me, I use it all the time - it's great! Maybe when you made a new player you device was actually running the old player (sometimes happens on Android if you don't remove the process, before installing). Maybe re-export, and install from a cold start of the device? hello sinistersoft, I haven't tried the compiled version of the apk, I was testing live from gideros studio on my android. So you're telling me that I just need to activate the GSFRX plugin for android then compile the apk and that should work? sorry guys, I will try that later, it is not in my to do list yet! I will let you know if I can't make it work. Thank you guys, have fun. 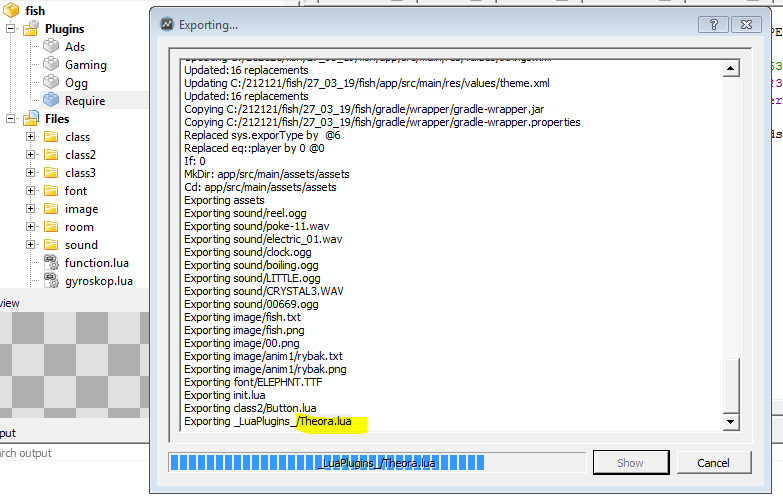 Theora is the video codec of ogg suite. Gideros supports both vorbis (audio) and theora.